Farmer Fred's Adventure Play Barn01485 579526work Children's Activity CentreState-of-the-art indoor play centre for kids 0-12 years. Stimulating 3D play experience transports kids to a world of adventure and fun. 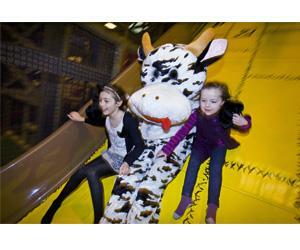 Giant slides, ball mazes, 2-4s low ropes adventure course and dedicated 0-2s area. Healthy menu using quality local produce. State-of-the-art indoor play centre for kids 0-12 years. Open: daily, weekdays 9.30am-6pm, weekends 10am-6pm. Play may be limited to 2 hour time slots at busy times.